Clearly this Guido guy is an idiot. Way to singlehandedly keep the stereotype of the Italian homophobe alive buddy. With that said, I really don’t know where this boycott is getting the grapes to go after Barilla. Guido is clearly respectfully declining to portray anything but the “classic family” in his ads. He isn’t going around gay-bashing like other companies…..cough cough…..Chick-fil-A…. Secondly, when the hell have you ever seen a Barilla ad? 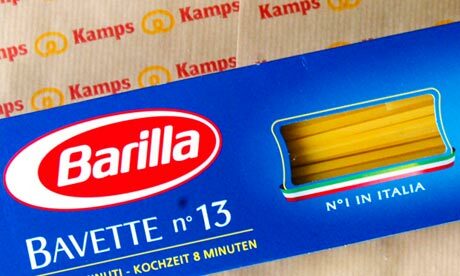 I think Barilla pasta is just one of those things you know is in the super market when you go shopping. Maybe, Guido, you just cut advertising all together. It would save you time, money, and the need to explain, respectfully of course, that you are a homophobic company. Hey Guido, it’s your call. I would just keep my mouth shut, even bringing it up can’t help your company. However, I do respect your opinion on the boycott. Total CEO move. The only thing about that statement, Guido, is that you now have a nationally trending topic on Twitter of #BoycottBarilla. That can’t be good for business. PS- Whatever happens this is sure to cost Barilla a pretty penne………..
Posted on September 26, 2013, in Average Blog Posts and tagged gay, gay rights, italy. Bookmark the permalink. 3 Comments.